So, I am in the thick of moving. Packing more boxes and trying to make arrangements with moving vans - this has been my existence for the past couple of days. As counterproductive as it seems, I am easily distracted by the window. The view from my apartment, which for all intensive purposes is not anything extraordinary or spectacular, is capturing my attention. It captures my attention more than I would like. For I am moving and sitting at the window, staring out on the view is not productive. I know this. However, I feel as though I am saying goodbye to a friend and we have to spend time together before I depart. I have sat at this window for two years, noting the changes of the seasons and the observing the skyline and the neighborhood below. It is different than when Sheila and I first moved here. The old tree in the backyard is long dead and much of it came down in the storm last week. Where will the birds perch and sing their daily song now? Much of the skyline has been altered completely by the building of new condos. Our building, for a time, was the tallest around. Another neighbor building has fallen. Another new condo has sprouted up in its place. Our building now is a dwarf amongst giants. Will it be next? The church service spoken exclusively in Spanish that drew hundreds of parishioners every Monday night held in our neighbor's backyard no longer meets. It is quiet now except for the shrill car alarms going off every time a vehicle passes or some neighborhood kid gets too close. They are angry now. They don't sit out on the stoop anymore laughing and saying hello to the people who pass, helping people with their groceries. Do they sense that they are slowly being edged out? I used to pass an empty lot that used to store shipping containers, listening to the birds and seeing the morning glory vines blossom. I would watch the house sparrows throwing themselves down in the dust and rolling about, leaving little circles where their bodies were. It has been razed to the ground. Plywood sheeting has gone up along the fence to conceal their digging. For what? No one knows. Perhaps the foundations of another condo. The view from the window is different now. I am different now. It is strange to leave a place that for a time has been so much about my everyday story. It is strange to not call a place home anymore. 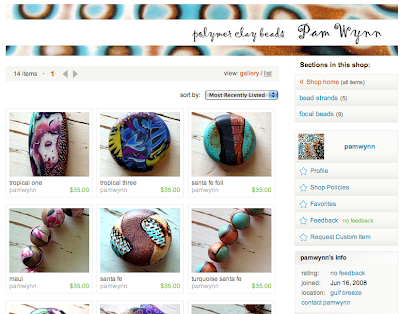 In Milwaukee, I was tipped off that the wonderful Pam Wynn was starting her own Etsy site! It's great! I am so proud of her. If you were thinking, "Hey!?!? Where do I know that name from?" Well, you might have seen it in several different magazines and books or are familiar with her sweet daughter, Heather Wynn. Together they create their own polymer tour de force! 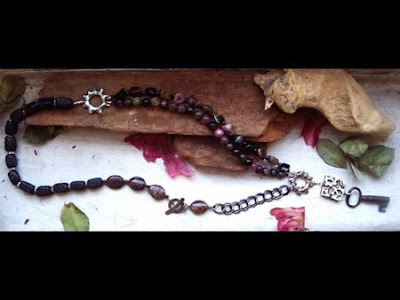 CLICK HERE to visit Pam's Etsy Site. Another of the films on my list of Oscar-movies-to-see list is a charming movie called, Juno. All throughout the movie, I kept thinking, "How clever!" It was definitely a quirky film, loaded with fast-paced colloquialisms, a wicked sense of dark humor, and studded with seemingly genuine emotion. Not to mention that the indie-folk rock soundtrack fit like a glove! I totally recommend it. In 2001, the Taliban destroyed two statues of Buddha in Bamiyan. 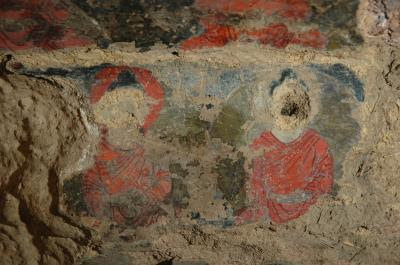 Behind the statues were caves that contained murals, many of which were damaged in the attack, exposed to the elements, very old and in much need of restoration. Due to the publicity of the attack, researchers and restorationists moved in on the caves and made an interesting discovery. I distinctly remember an art history class that firmly attested that oil painting was "invented" in Europe during the "Renaissance." What researchers and scientists found was that these caves were home to even older specimens of oil painting. The paintings that utilized poppy and walnut oils (among other things) pre-date the European paintings by a couple of hundred years. I think this is yet another example of how much credit for innovation and invention is often given exclusively to Western origins until hard scientific facts change that perspective and open the lens to include other "non-Western" peoples. I've been quite behind in my movie watching lately. For instance, usually I try to make a point of watching all the movies nominated for the Oscars. Alas, life has been all consuming. However, I've stolen a few hours (probably ones I could have spent catching up on rest) and watched La Vie En Rose. The movie is based on the life of Edith Piaf, The Little Sparrow. I found it heartbreaking and soulful - a movie capturing the aching trials of a tragic and talented performer. This movie is beautiful. It reminded me of a summer spent in the studios, sitting around a formica table laden with oranges and wine bottles. The faint smell of clove cigarettes and Nag Champa wafted around, dancing in the air with each turn of the oscillating electric fan. My hands were smudged with charcoal and flecked with paint. In the background, we played Edith Piaf on repeat. It was the only album we could all agree upon. The movie brought back many memories. 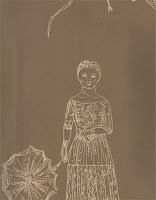 The latest book I finished reading on the train was Once Upon A Time In The North by Philip Pullman. I am glad that he's making installments to the world(s) that he originally created in the His Dark Materials Trilogy. This novelette focuses on the character Lee Scoresby and how he originally met the armored polar bear Iorek Byrnison. Just like Lyra's Oxford, it was a perfect little tidbit to tide me over for his forthcoming book, The Book of Dust. Being between two places, I've found it hard to keep on top of my mail. 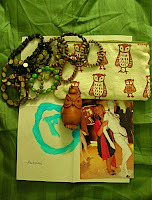 So, it was quite a nice surprise to see a package all the way from Hawii from my talented friend, Candice Wakumoto. She sent me a little care package from paradise. In it, she sent these great Japanese chocolates, some haupia coconut pudding, and a set of miniature food! To the left is a picture of my tiny tropical feast! I love it! 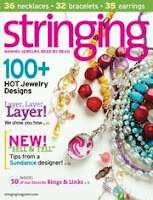 I just saw the latest issue of Stringing Magazine. It's awesome! The magazine is one of my favorites and not just because I'm one of the contributors. 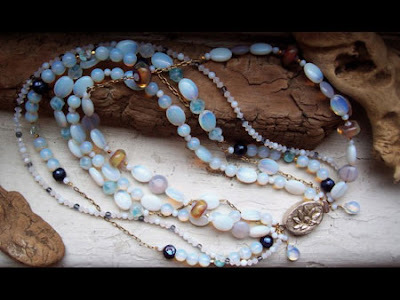 (You can see two of my necklace designs, Trocadero and Sakura in the latest issue.) I love the magazine because is expertly edited and selectively curated and because it is the quintessential designer's guide to jewelry today. That may sound like rather grandiose praise, but it is an excellent cross-section of artisans and jewelry designers from across the globe and what they're making. I know that whenever I pick up a copy, I'm instantly inspired and my fingers itch to start stringing. I forgot what torture it is to move. Even when it isn't rushed like many of my recent moves have been, it still is tedious and laborious. Not very fun when you're already tired from working all day. I am hoping to get done with a big chunk of it tonight and tomorrow morning so that I can go to the Mermaid Parade in Coney Island tomorrow afternoon. I haven't been out to the beach yet this season and I desperately need some rest and relaxation. I just wanted to thank everyone who voted in the Bead Star competition. It was truly an honor to be selected as one of the finalists and participate with so many talented designers. I believe it will take some time for them to come up with the results. Wish me luck! I haven't been blogging very much lately. Instead I've been spending a lot of energy on getting back in touch with friends and family. The progress has been slow in coming, but I think well worth it. Thanks again to everyone who voted! So a few of my designs are finalists for a beading competition called, Bead Star. It's presented by Interweave Press and Beading Daily. Vote for me! Pick my designs! 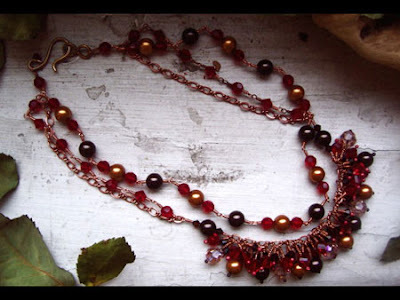 Join Beading Daily and vote! Here are my designs, their numbers, and the categories you can find them in. CLICK HERE to vote! Oh, what wonderful news! 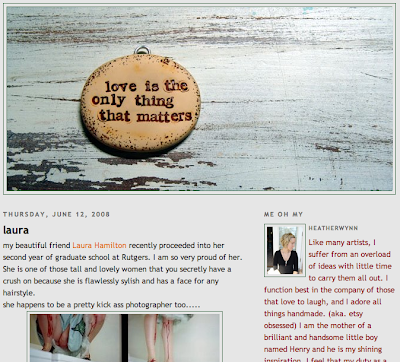 Heather Wynn has started her very own blog. It's great! I know a good many people who've been waiting for this for a long while. I can't wait to keep up with my good friend through the blogsphere. CLICK HERE to visit her new blog! 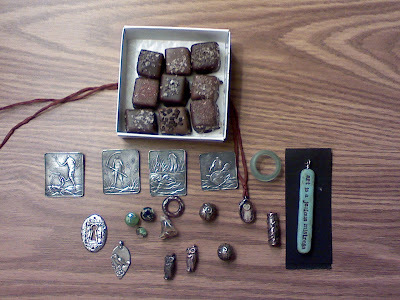 My good friend Heather Wynn, who is the maker of beautiful polymer pieces and stamped silver, sent me a little care package. She too has a bird fetish and found a wonderful source of hand-stamped goods from MoonTeaArtwork on Etsy. She picked the owl pencil case for me. She also sent along some beautiful Czech glass from Raven's Journey, a drawing from her boy Henry, a carved owl box, and a picture of her from the Swarovski party in Tucson. It was a wonderful little surprise that brightened my day. I got in late last night. I was hit in the chest with a solid wave of heat as I exited the airport terminal. I had heard that the northeast was stricken by a heat wave, but I hadn't really expected it. The humidity weighing down on me didn't feel real. The sweat on my face didn't seem like it was actually there. I am sad to leave the show behind. I got to see my family and spend time with friends whom I only see once or twice a year and met new people and made new friends. It was a lot of work, but it was fun work and we had a great time. I am glad to be back, but it is hard to leave everyone and everything behind. I have not adjusted quite yet. I'm not sure when it will all sink in and feel normal again. Maybe when the routines and rituals fall back in place I'll finally return. Well, it's quite late and I really need to rest up for the last day of the show, but I wanted to briefly fill in on what we've been up to. We had quite an exciting day with all the tornado warnings. They actually kept the customers indoors and wouldn't let them leave. 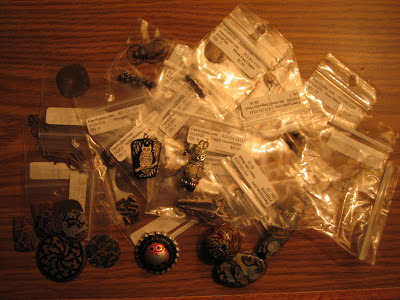 I got a stash from Lillypilly Designs, a bottle cap pendant from Cathy Collison of Glass Garden Beads, some lampwork beads from Beads by Kathy Perras, lots of brass from Vintaj via Family Glass, an owl from Penny Michelle, and a piece from Joan Miller. Lots of goodies, but not quite as many since I've been at the booth so much. We've been going out and catching up with lots of folks after the show closes up. Last night we had Indian. Tonight we had Japanese and celebrated Sak of Saki Silver's birthday at Nanakusa. Then we went out to celebrate Lindsey of Fusion Bead's birthday at Zenden Lounge. It was lots of fun. But it is really late and I have to go to bed soon. I have some wonderful things to share. However, my camera card is still in Brooklyn and I think my siblings have gone to bed for the night. So any pictures will have to wait till tomorrow or the next night. Today was quite an eventful day. We worked hard. I'm not kidding you. We had a little line to deal with most of the day. This prevented me from shopping, which is probably a good thing. If you read my blog, please do stop by the booth and say hello! I love meeting people and seeing who actually reads my blog in person. 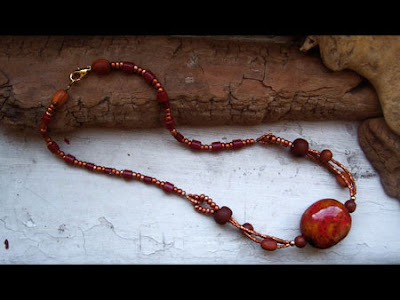 There's quite possibly a free bead in it for you if you do stop by and say you read our blogs. Perhaps... maybe we need a code word? Maybe not. Just stop by our booth and say hello. It's great fun! Make sure to bring anything you've been working. It's a lot of fun to see how people are working with our pieces or getting along otherwise. In other news, it was quite an eventful day. When we finally did get away from the table, Azalea, Cynthia and I went to Applebee's for lunch and then there was a tornado warning and they were trying to get us to shuffle downstairs for a while. When you've been standing all day and your feet are tired and you're hungry like crazy, tornados have little impact. Luckily we were able to finish out the show and then have Indian food for dinner, which was REALLY good. It was a long day, so I think I'm going to run back upstairs and jet! So, I got into Chicago yesterday and got to spend some time at our friend Jeremiah Ketner's studio and see some of the pieces that he's been working on. That was great! It was wonderful seeing his neighborhood and looking at the new direction his work is taking. Cynthia, Greg, Weasel, Bob, and Azalea came by and picked me up and we made our way perilously through the fog and rain to Milwaukee. It was late when we got in and I had still yet to do laundry. I fell asleep while reading the new Philip Pullman book waiting for the dryer to finish. Bright and early we made our way to the convention center to set up. It was BUSY! We worked so hard. I didn't get a chance to shop very much, but above are a couple of things I got. The prize of my yield are the Anne Choi brooches! They're AWESOME! I've also got some goodies from Heather Wynn, my family at Green Girl Studios, a recycled glass ring from Cathy Collison, and some glass beads from a swag bag placed in our Bead & Button gift bag. It's hard to imagine that in a little bit, I won't be here anymore. The daily routine will be broken and I'll be in another city, with other people. It's strange. I always get this feeling before a trip. It always boggles my mind to think of how in another time, this wouldn't really be possible - that it would take months to make the journey on foot that I'm making in a handful of hours. I guess I'm still in awe of the technology that makes this possible. Inevitably, I've bitten off more than I can chew. I guess it's one of those indelible things about my personality. I will always aim high and always try to finish more than what it logically or reasonably possible. So I have a smattering of half finished projects all waiting to be completed. I could think of this as a failure, but instead I will think of this as many good starts. So, if you happen to be at the Bead & Button show in Milwaukee this weekend, you should definitely drop by and say hello. I will be working at my family's booth at Green Girl Studios. I always like meeting new people and seeing familiar faces! Hope to see you there! Alas, my schedule no longer permits me to visit the Brooklyn Flea on Sundays where I have formerly purchased cookies and marshmallows from Whimsy and Spice of Brooklyn. This doesn't mean that I can't enjoy their wonderfully delightful creations though. They have an Etsy site! CLICK HERE to visit it. 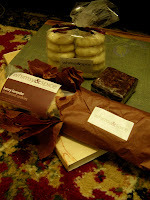 This means that I can munch on their powerfully delicious goodies while reading their blog in the comfort of my apartment. Featured in the New York Times Magazine, this wallpaper named Maiden & Moonflower was created by Kiki Smith with Studio Printworks. It is lovely and lyrical and comes in six colors. Priced at $450 a roll, it doesn't exactly fit the budget for this student loan riddled former art student. However, it did not stop me from requesting a sample, to which they complied! Awesome! I dropped by Barb McLean's eBay site. CLICK HERE to check it out. She's got so many examples of many talented artists. 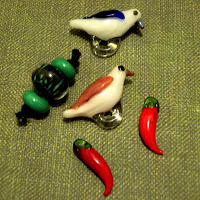 I found two great bird pieces and a pair of chili peppers (perfect for earrings) by Dan Eister of Eister Glass. Her freebie for this month were the green rondells by Margret Zinzer.